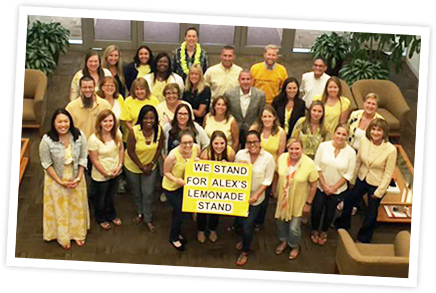 By partnering with Alex’s Lemonade Stand Foundation (ALSF), your company can truly make a difference in the fight for better treatments and cures for childhood cancer. Childhood cancer—the leading cause of death by disease in children under 15 years old in the U.S.—is devastating. However, there is hope in the form of cutting-edge, innovative, breakthrough research that will bring cures to all children. ALSF is one of the top funders of childhood cancer research in the U.S.—funding nearly 1,000 research grants at top-institutions throughout North America. Whether you’re a Fortune 500 company or a small business, your partnership will help us get closer to cures for all types of childhood cancer. Our team will work with you to develop a customized partnership program that fits your brand and business culture. Browse ideas below, or please contact Liz Scott at [email protected] for more information. For questions regarding business partnerships, please contact Liz Scott at [email protected].